Sensitive teeth occur when tooth enamel becomes worn, or roots of the teeth get exposed causing dentin hypersensitivity or root sensitivity known as sensitive teeth. Hypersensitivity can lead to a sharp, temporary pain with hot/cold drinks or food, sensitivity when brushing your teeth, and unpleasant reaction to sweet or sour foods or even a breeze of cold air. Discomfort can be caused by other factors such as a cavity, a worn filling, gum disease or also a cracked or chipped tooth which, if not appropriately treated, will worsen over time. 1. Brushing too hard – one of the common reasons for sensitivity is pressing too hard on the toothbrush. By pushing harder, you are not removing more plaque but, instead, damaging a layer of enamel by brushing too hard side to side. Try using a soft bristle toothbrush and work at a 45-degree angle to the gum line and avoid excessive pressure. 2. Teeth whitening – bleaching too often can cause teeth sensitivity. The good news is that teeth sensitivity from bleaching is usually temporary and when you stop, sensitivity will fade away. Consult with our dentist on how bleaching can affect you. 3. Teeth grinding – (Bruxism) is a common reason for sensitivity because it wears down teeth enamel. If you wake up in the morning with a headache or sore jaw muscles there is a good chance you grind your teeth at night. Stress is the most common reason for teeth grinding. 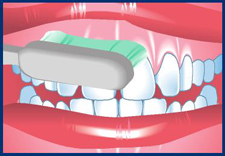 The good news is that bruxism can be helped by wearing a night guard when you sleep. Learn more about teeth grinding in our blog. 4. Acidic drinks and food – Carbonated sodas, citrus fruits, candies, high sugar carbs, wine – all these choices can slowly remove enamel from your teeth. If you have acidic drinks or foods, drink water and wait up to an hour before brushing your teeth (to reduce acidity). 5. Gum disease – plaque and tartar can build up on your teeth and may cause gums to recede, exposing roots and causing sensitivity. The longer you wait before treating gum disease – the more chances it can destroy the structural support of your teeth. Learn more about gum disease and treatments. 6. Cracked tooth – when you break or crack a tooth it can go all the way to the bottom of the root. Treatment of a cracked tooth depends on the size of the crack and other factors, and your dentist can recommend the best solution. 1. A desensitizing toothpaste – it contains potassium nitrate which with time, blocks pathways through the teeth which causes sensitivity. It can take up to four (4) weeks to reduce sensitivity. 2. Fluoride Treatment – your dentist may apply fluoride to the sensitive area of your teeth to strengthen tooth enamel and reduce discomfort and may suggest continuing with prescription fluoride treatment at home using a custom tray to help with the application. 3. Dental Fillings – if gums recede and exposed roots are the cause of the sensitivity, one way to address it is to place dental fillings on the exposed roots – strengthening tooth core. 4. Surgical Gum Graft – another method used is a placement of a synthetic gum or a tissue taken from another area of the mouth to cover exposed teeth roots. This can protect exposed roots and reduce sensitivity. 5. Root Canal – in some cases tooth sensitivity can become severe. When other treatments are not effective, your dentist may recommend a root canal. Although this procedure is more invasive it is considered the best technique to eliminate tooth sensitivity. Maintain Good Oral Health – follow proper brushing and flossing techniques to thoroughly clean your teeth and mouth twice a day. Everything starts with proper care and by taking time to care for your teeth - you can avoid sensitivity in the first place. Use a soft bristle toothbrush and desensitizing toothpaste. Regular dentist visits – have your teeth cleaned regularly by a dental professional to remove plaque and tartar buildup.